Keeping in touch with older relatives can be challenging when they don't use e-mail. You can't send grandparents digital photos unless they're techno-savvy, so you'll have to find a decent printer or pay to print them out. Then, you have to put it all in an envelope, and stick on proper postage. But maybe you're traveling and don't have time for all that, or don't want to feel stuck in the 1990s. A new Web site called Sunnygram is helping update and enhance communications between young people and their relatives who do not use the Internet. Co-founder Matt Ahart was inspired to start the service when he found himself sending e-mails to his mother so that she could print them out and show them to his grandmother. What if there were a service that could facilitate electronic correspondence between people and their grandparents? The idea is simple: Your older relative gets an e-mail address that you can write to, and Sunnygram prints out your messages and photos and sends it via snail mail in a weekly "newsletter" that's a lot prettier than an e-mail printout. Then, the relative has the option of responding in writing on personalized stationary, or electronically by calling a phone number and leaving a voice message, which gets transcribed and sent to you in an e-mail. The service provides unlimited e-mail and photo printing, and any number of family members and friends can correspond with the designated holder of the e-mail address. Sunnygram also reminds you when a special occasion is coming up, such as Mother's Day or Father's Day, in addition to reminding you to write to your relative if you haven't in a while. "Our users can rest assured that Grandma won’t be forgotten," Ahart said. Since launching in April, Sunnygram has been adding customers around the U.S. and the world, including members of the military writing to their elderly relatives. And some people are using it to bridge communication gaps that don't necessarily have to do with age. 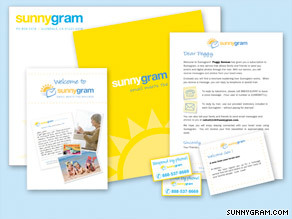 Sunnygram has been used among family members of people in prison. "It’s not just about age or technological savvy - sometimes other circumstances in their lives cause them to not be able to check email, but to have access to mail, so we step up in that situation," Ahart said. The service costs $9.95 a month, with a one-month free trial. The service will also soon launch a Facebook application, Ahart said. Sunnygram is great! I use it for two grandmothers-in-law, and it makes sending pics of our children simple. The printing quality is excellent, and the price is very cheap. Er, why not just send Grandma a letter directly? This is a great service, there are a great amount of people who have limited access to the internet, no access at all, or cannot afford the access. As far as the fear of killing trees, the paper industry is an extremely huge industry, click on google and learn more about the industry, I'm sure you will be surprised about the myth of killing trees. I've been writing letters monthly or so back and forth with my Grandmother for 25 years or so. Even with email, there is no one else I keep in as regular of contact with. And when she tells me of a friend passing, and the wriging gets wobbly and has tear marks, well, that still means a helluva lot more than just typing *sad*. As great as email is, and as much as I use it, I do treasure letter writing and the closeness it brings that typing just can't. And god bless the postal carriers! lol wriging. I meant WRITING. Less typos/spelling mistakes when you write it by hand, too. This incident should be a private matter handled in a low key manner without media involvement! Would your media exec allow this story to break if it was their daughter or sister? Of course not! It's not all about ad revenue! Sometimes you need to look at why you are stepping on someone's neck BEFORE you do it! So much for class and moral decency! I hope one sunny day, when the storm comes your way, you'll remember how merciless and inconsiderate you were! It is written "to those who are merciless, God shows himself to be merciless." I know you guys are probably having a sick cynical pig snorting laugh about this comment! I understand that you don't care and that's why I hope when the rains come for you, that same nasty, cynical pig snorting laugh will ring loud in your ear as it's all coming down on you! Sadists! Depending on how good your common sense skills are you should eventually conclude that this service milks the fruits of your labor by appealing to your indolence. haha.. she said "ER".. oldskoo..
a. Pick up the phone and call. Gotta be less expensive than $9.95/month. b. Print the letter out, or even handwrite it(!) and mail it yourself, for the cost of a stamp. c. Print the digital photos, either at home or via a paid photo lab, and mail them along with the letter? (Or, if you're using an online service to print them, you can have them mailed to your relative instead of to yourself.) Again, the cost is sure to be less than this service's monthly fee. To each their own, of course, but I think the direct contact of a phone call or a letter that YOU wrote, addressed, and sent, is a more meaningful way to communicate. Liz Cheney should take time to get her facts correct about the Canadain Health System before she goes on National TV. spewing her mouth off. Canadian Health is not perfect, It is not Socialist.We pay for Medical Care through a progressive Tax System. It is portable.I can have medical care in any one of our ten Provinces or in our three Territories. I can also receive partial insurance payment on medical services received out of Canada.Your Medical service is so costly that it is wise for Canadians travelling in the U.S.A. to purchase additional coverage. I do get to select my own doctor. Our Medical system is no different than most countries. Most serious cases get first consideration.Money is not the determinate for good service.....Mildred Dufort, Beausejour Manitoba Ca. Let see, Grandma doesn't have a computer, so what do you do? Pick up the phone? Write a letter? No, you e-mail a company, pay them $9 a month to print a letter on pretty paper and then they mail it for you!!!! How weird is that? Un less you are sending your Grandma 3 letters a day then it is still cheaper for you to buy the stamp yourself. Maybe I should start a compnay–e-mail me the basic facts of what you want to say and I'll hand write the letter myself. That way you Grandmother is lead to believe you actually care to write a letter. Call or write? When was the last time you wrote a letter? Letter writing has become obosolete with email so handy. So...while I am sending pictures and emailing family information to my computer savy friends and relatives I can also send Grandma the same! Believe me she gets many more "letters" with this service than she would without it. FYI She loves it and has told me so! I am not being mean, but if you've ever tried to talk on the phone to my Mom, you would know why this is a good service. Not to mention that I have so many other relatives that will also send things to her that I believe she will be waiting for the mailman every Monday morning in anticipation of receiving DOZENS of communications from people she normally does not hear from. She will be included in many things that she misses because she doesn't have email. This does not mean I will never call her or see her again.